A dynamic 11 minute update on Who is Destiny? & What it does. Interview on History is Storytelling & The Destiny Foundation. Interview on Berel Wein – The Voice of Jewish History. Interview on What is Past – is Prologue. TV Interview With Berel Wein – a taste of “Vintage Wein”. Preview on Destiny’s new Online, Jewish history, learning website. Crash Coirse Video Sample Jews Come to the United States. Berel Wein and director, Ashley Lazarus, launch the Faith & Fate Series in South Africa. Interview on Teaching Jewish history in a new way. Interview on Listening to teachers and producing teaching materials. Interview on Destiny’s modular “choose & use” educational materials. Overview of the series. The Story of the Jewish People in the 20th Century. In the 1900s there were 10,5 million Jews in the world. This is their story. 1900 – 1910. The Decade of Imperial Conflict. The Balkan Wars, WW1, Russian Revolution. 1911 – 1920. The story of the Remnants of the Holocaust and how Israel was established. 1945 – 1948. Israel’s fight for survival. The real source of the Arab Israeli conflict. 1948 – 1957. Short demo on the Educators’ Multi-Media Guide. It’s content. How to use it. Dawn of the Century 1900 – 1910. The full 69 minute movie. Prof Yaffa Eliach Father Questioned God Educators’ Guide Interview Clip. Paula Gris Triumph Over Evil Educators’ Guide Interview Clip. Prof. Zvi Gitelman Polish Anti-Semitism After WWII Educators’ Guide Interview Clip. Prof Anita Shapira Survivors – And the Struggle for Israel Educators’ Guide Interview Clip. Preview for the Illustrated and Animated Heralds of Destiny Series. Trailer on Rambam -Leader of Spanish Jewry in the 12th century. 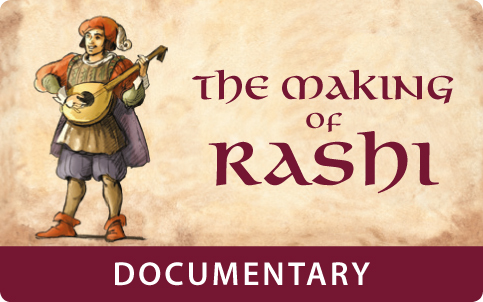 Trailer on Rashi -12th century remarkable Jewish Leader and Role Model. Behind the scenes film on how Rashi was made. Rashi – A Light After the Dark Ages. The full 56 minute movie. Trailer on the inspirational and mystical Stories of the Chassidic Masters.